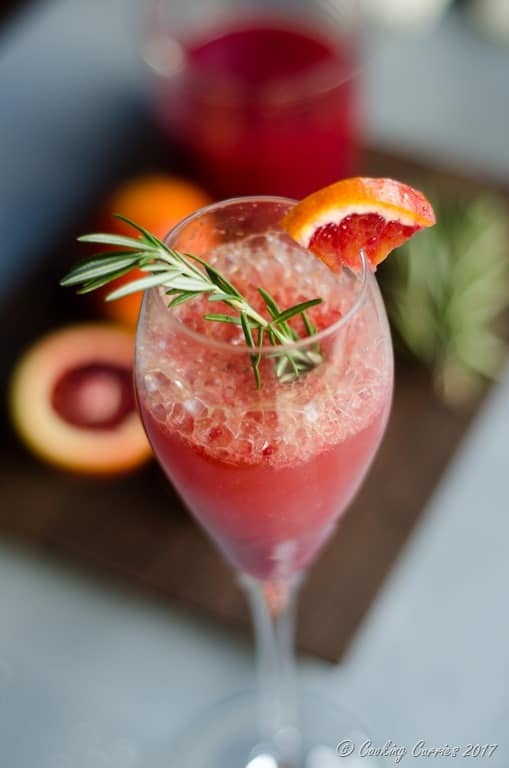 Bright red blood oranges combine with some fresh rosemary and dreamy vanilla to make this ultimate brunch drink of Blood Orange Mimosas! Cheers! Spring is all about flowers and colors and brunches. Brunches are all about mimosas. At least for me. 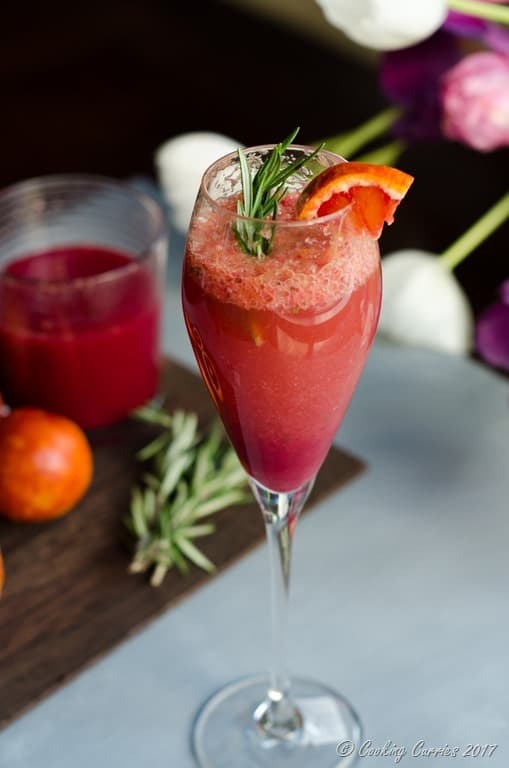 Combine the colors and mimosas together to make your spring brunch extra special. Fresh blood oranges are a thing of beauty indeed. Whether you juice them or just slice them and lay them out on a plate. They can just brighten up your spring brunch table just like that! 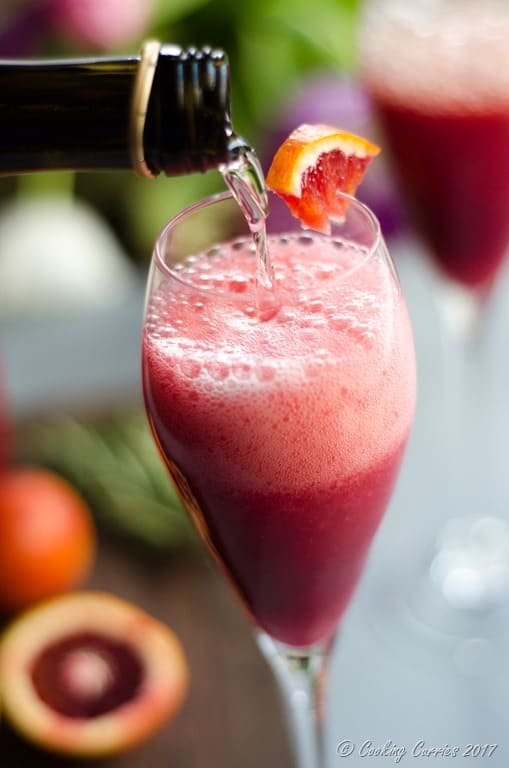 I did not want to make just a regular blood orange mimosa, you know me better by now, right. I know citrus and herbs go well together and wanted to try something herby with this mimosa. Out comes my trusty guide, that helps me come up with all kinds of flavor combos. The kind of combos that I know will work. I still experiment by myself a lot, but it is good to know sometimes that a certain flavor combo will work and you can just trust and go ahead with the recipe. If you are in the business of recipe development, whether it is in your own kitchen cooking for your friends and family or help out food companies and brands, like I do, this book is your bible. I mean, its called The Flavor Bible for a reason, right! It has most ingredients under the sun and the other ingredients whose flavor complements and elevates this, to harmoniously come together in a dish. Sometimes, I simply browse the book for inspiration and when I see a certain flavor combo, I get inspired and get to work to come up with something creative with it. It is seriously THE BOOK you all should have in your kitchen. 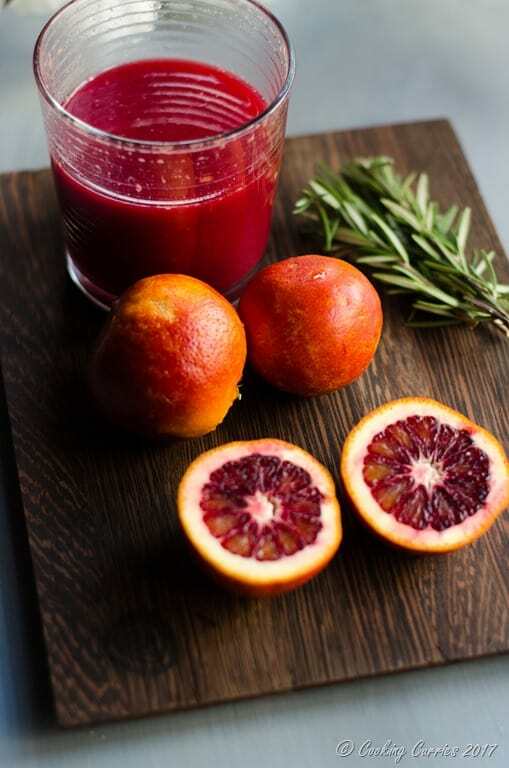 This blood orange + rosemary + vanilla combination is something I got inspired from The Flavor Bible. Go ahead, try it and you will love it and your guests will love you for taking the boredom out of your regular orange and grapefruit mimosas. Well, it can never be truly boring when there is alcohol involved. But that is for another time. Until then, cheers! 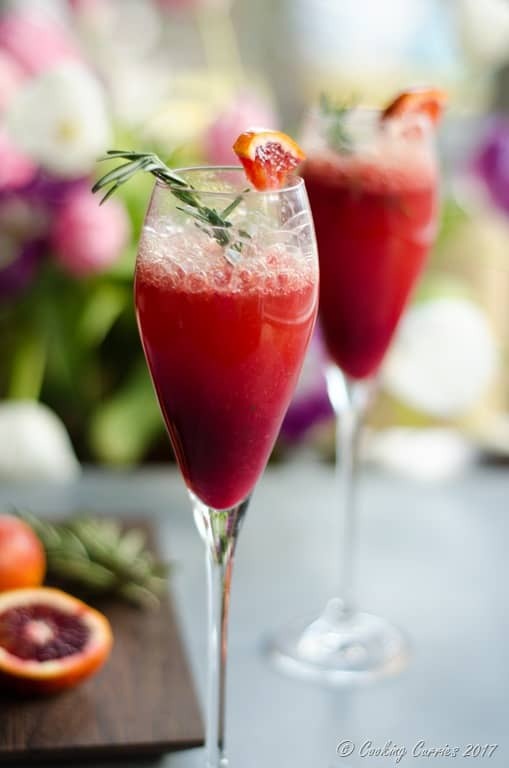 And don’t forget to check out our other brunch favorites and these crowd favorite drinks for brunches that you plan to host this spring and summer, whether it is for Easter or Mother’s Day or just because. Take the leaves out of the one sprig of rosemary and crush it in a mortar and pestle to release the oils. Crush well as we are not going to strain them out and you don’t want big pieces of rosemary in between sips of your mimosas. 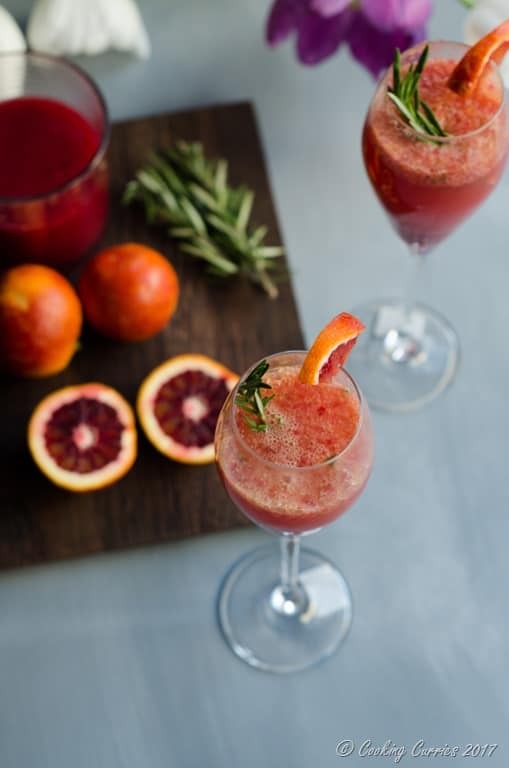 Mix the crushed rosemary and the vanilla to the blood orange juice. Pour a little of it into serving flutes. 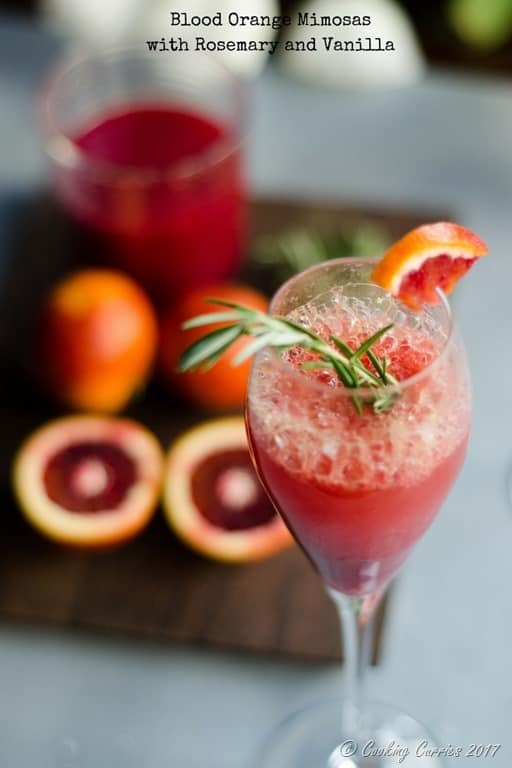 Top with chilled prosecco and garnish with small sprigs of rosemary and blood orange wedges. Enjoy right away!